Russia has seen a huge surge in tourism. Though obtaining a visa is becoming increasingly more difficult (especially for American travelers), the country has a rich social, cultural, and geological history. Strangely, Siberia has also seen an uptick in tourism—the island of Yttyran, in the Bering Sea, is no exception. Yttygran Island has seen a recent surge in popularity among ecotourists. Visitors travel from around the world to see Beluga whales around Yttigran and Arakamchechen islands, but Whale Bone Alley is arguably the most popular destination. Situated on the northern shore of Yttygran Island, the alley consists of a large number of carefully arranged whale skills, bones, and stones. 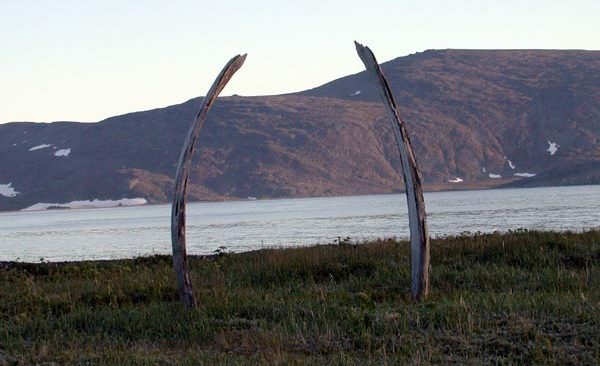 Many believe that Whale Bone Alley was used as a central shrine by several neighboring villages, but there is not enough data to definitively state its purpose. The site extends around 1800 feet along the northern coast and lies along a while migration path. Consisting of hundreds of whale bones—primarily jaw, rib, and vertebrae—While Bone Alley is believed to have been created around 600 years ago. The stunning bone formations sit next to a number of pits, which were likely used to store food for the gathered tribesmen. Walking through the bones is an eerie, somewhat peaceful experience, but the site is becoming more popular by the year. Traveling to this remote destination is easier than one might assume. In fact, it is only around 500 miles from Anchorage, Alaska and only around 120 miles from Port Clarence. However, if you do travel to Yttygran Island, be sure to pack appropriately—the cold weather is enough to drive most tourists away, and the lack of infrastructure means most visitors end up camping. However, several small villages exist along the Siberian coast—just be sure to speak some survival Russian.